SEE•HEAR•TRANSFORM brings together a group of artists who will collaborate and explore the transformation processes in urban social contexts through artistic experiments. SEE•HEAR•TRANSFORM consists of three LAB sessions. 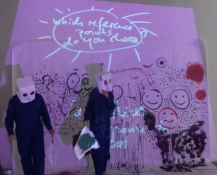 The first LAB session, which took place place in July 2015 at Connecting Space Hong Kong, was an experimental workshop setting to establish an interdisciplinary, artistic, and collaborative exchange on transformative processes in urban social contexts. The second LAB session took place in January 2016 in Berlin and developed further the artistic collaboration by focussing on pain and living conditions and entering into a dialogue with the Zentrum für Literatur- und Kulturforschung Berlin. 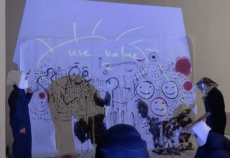 The last LAB session consisted of an interactive installation as well as one public workshop, presenting the results of a one year collaboration at the Zurich University of the Arts in Zurich. Information on the second and third LAB will be following soon.